How should a free society protect privacy? Dramatic changes in national security law and surveillance, as well as technological changes from social media to smart cities mean that our ideas about privacy and its protection are being challenged like never before. 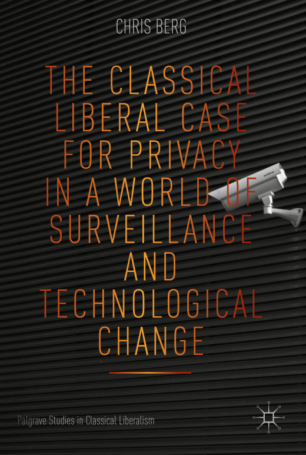 In this interdisciplinary book, Chris Berg explores what classical liberal approaches to privacy can bring to current debates about surveillance, encryption and new financial technologies. 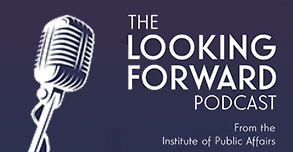 Ultimately, he argues that the principles of classical liberalism – the rule of law, individual rights, property and entrepreneurial evolution – can help extend as well as critique contemporary philosophical theories of privacy. With Darcy Allen, Alastair Berg and Jason Potts. At the end of May 2018, the most far reaching data protection and privacy regime ever seen will come into effect. Although the General Data Protection Regulation (GDPR) is a European law, it will have a global impact. There are likely to be some unintended consequences of the GDPR. As we outline in a recent working paper, the implementation of the GDPR opens the potential for new data markets in tradable (possibly securitised) financial instruments. The protection of people’s data is better protected through self-governance solutions, including the application of blockchain technology. The GDPR is in effect a global regulation. It applies to any company which has a European customer, no matter where that company is based. Even offering the use of a European currency on your website, or having information in a European language may be considered offering goods and services to an EU data subject for the purposes of the GDPR. The remit of the regulation is as broad as its territorial scope. The rights of data subjects include that of data access, rectification, the right to withdraw consent, erasure and portability. Organisations using personal data in the course of business must abide by strict technical and organisational requirements. These restrictions include gaining explicit consent and justifying the collection of each individual piece of personal data. Organisations must also employ a Data Protection Officer (DPO) to monitor compliance with the 261-page document. Organisations collect data from customers for a range of reasons, both commercial and regulatory — organisations need to know who they are dealing with. Banks will not lend money to someone they don’t know; they need to have a level of assurance over their customer’s willingness and ability to repay. Similarly, many organisations are forced to collect increasingly large amounts of personal data about their customers. Anti-money laundering and counter-terrorism financing legislation (AML/CTF) requires many institutions to monitor their customers activity on an ongoing basis. In addition, many organisations derive significant value from personal data. Consumers and organisations exchange data for services, much off which is voluntary and to their mutual benefit. One of the most discussed aspects of the GDPR is the right to erasure — often referred to as the right to be forgotten. This allows data subjects to use the government to compel companies who hold their personal data to delete it. We propose that the right to erasure creates uncertainty over the value of data held by organisations. This creates an option on that data. The right to erasure creates uncertainty over the value of the data to the data collector. At any point in time, the data subject may withdraw consent. During a transaction, or perhaps in return for some free service, a data subject may consent to have their personal data sold to a third party such as an advertiser or market researcher. Up until an (unknown) point in time — when the data subject may or may not withdraw consent to their data being used — that personal data holds positive value. This is in effect a put option on that data — the option to sell that data to a third party. The value of such an option is derived from the value of the underlying asset — the data — which in turn depends on the continued consent by the data subject. Rational economic actors will respond in predictable ways to manage such risk. Data-Backed Securities (DBS) might allow organisations to convert unpredictable future revenue streams into one single payment. Collateralised Data Obligations (CDO) might allow data collectors to package personal data into tranches of varying risk of consent withdrawal. A secondary data derivative market is thus created — one that we have very little idea of how it will operate, and what any secondary effects may be. Such responses to regulatory intervention are not new. The Global Financial Crisis (GFC) was at least in part caused by complex and rarely understood financial instruments like Mortgage-Backed Securities (MBS) and Collateralised Debt Obligations (CBS). These were developed in response to poorly designed capital requirements. Similarly, global AML/CTF requirements faced by financial institutions have caused many firms to simply stop offering their products to certain individuals and even whole regions of the world. The unbanked and underbanked are all the poorer as a result. What these two examples have in common is that they both have good intentions. Adequate capital requirements and preventing money from being cleaned by money launderers are good things, but good intentions are not enough. Secondary consequences should always be considered and discussed. Self-governance alternatives, including the application of blockchain technology, should be considered. These alternatives use technology to allow individuals greater control over the personal data they share with the world. Innovators developing self-sovereign identity solutions are attempting to provide a market based way for individuals to gain greater control over — and derive value from — their personal data. These solutions allow users to share just enough data for a transaction to go ahead. A bartender doesn’t need to know your name or address when you want a drink, they just need to know you are of legal age. Past instances of regulatory intervention should make us cautious that even well-meaning regulation will achieve its stated objectives with no negative effects. Self-sovereign identity, and the use of blockchain technology is a promising solution to the challenges of data privacy. If you blinked, you missed it. On December 18 last year, the Australia Bureau of Statistics announced that at the 2016 census in August it would, for the first time, retain all the names and addresses it has collected “to enable a richer and dynamic statistical picture of Australia”. Australian Federal Police Assistant Commissioner Tim Morris told an audience at the weekend that “those with nothing to hide have nothing to fear”. This was written up in Fairfax papers as “carefully worded case” for the Government’s mandatory data retention policy. Now, every piece of evidence we have suggests the terrorist threat right now is severe. It might be growing. But Morris’s statement is a worry. It lacks all sense of proportionality – essential when crafting security policy. More importantly, it shows how poorly defended our privacy rights are. Are we really at the stage where we even have to justify the very existence of private spaces – spaces where we are hidden from the all-seeing state? It is true that the value of privacy is conceptually difficult. We’re constantly trading away privacy for other goals. Whenever we provide our details to someone at a call centre, share secrets with friends, interact with governments, even simply go outside, we’re in some small way relinquishing control over our own personal information; allowing others to see or know details about ourselves that might otherwise be secured. It’s particularly difficult today, when we have more opportunities than ever to share information – and the authorities have more capacity than ever to obtain information about us without our consent. So many people dismiss privacy as a sort of anachronism: either a lost cause or something that only a recluse would care about. Privacy is dead. You’ve heard this before. But I’ll bet even AFP assistant commissioners secure their internet banking passwords and close their blinds at night. Privacy fulfils a deep psychological need. Society demands that we mask our true selves and moderate our behaviour when we interact with others. Social norms regulate how we act in public. In many ways these norms are valuable because they ensure a well-ordered public space. But those norms can also be stifling. We need a space of our own as relief from the judgment of others, if nothing else. Indeed, the move towards toleration for identity that violated current social attitudes – like homosexuality – was begun by defending the privacy of one’s own home. Happily we’ve moved past the days where sexuality is just a matter of what people do behind closed doors. But we shouldn’t forget how for such a long time privacy offered protection against an oppressive society. The need for privacy seems to be an innate part of the human condition. Ethnographers have found that privacy is a universal cultural attribute. And if you believe in individual freedom – if you believe in any way that we should protect the rights of the individual against the collective – you should be very jealous of any coercive encroachments on the private realm. Privacy is the citadel of personal freedom. It provides defence against expropriation, importunity, and imposition, against power and coercion. With all this in mind, the nothing-to-hide, nothing-to-fear argument is truly creepy. Think of all the assumptions that underpin it. First: you have to know what you’re doing is wrong. Second: you have to agree that what you are doing is wrong. Third: you have to trust government agents to only violate the privacy of the bad guys. Fourth: you have to trust government agents to not misuse what they find when they observe you. Fifth: you have to believe that only government agents are able to observe you. These assumptions are questionable, to say the least. Attorney-General George Brandis has been assuring us we can trust the Government, but that’s not very satisfactory. Anyway, government agents aren’t the only people who might access data kept under data retention laws. What about rogue staff of internet service providers? Or hackers attracted to these giant new honey-pots of data? Or private litigants? Data kept under data retention laws will be available in civil litigation as well. In his national security statement on Monday Tony Abbott flagged further legislation clamping down on “organisations that incite religious or racial hatred” and signalled his intention to strengthen “prohibitions on vilifying, intimidating or inciting hatred”. But the Government passed legislation that, we were told, was intended to do pretty much the same thing. I argued on The Drum in September that new limits on “advocacy of terrorism” were redundant at best, dangerous at worst. Who knows what this next tranche of laws outlawing advocacy of terrorism are supposed to add. But recall the first assumption of the nothing-to-hide argument. You have to know what you are doing is wrong. With speech prohibitions growing as fast as legislators can draft them, there’s every reason to be afraid for our privacy, and every reason to care when it is taken from us.